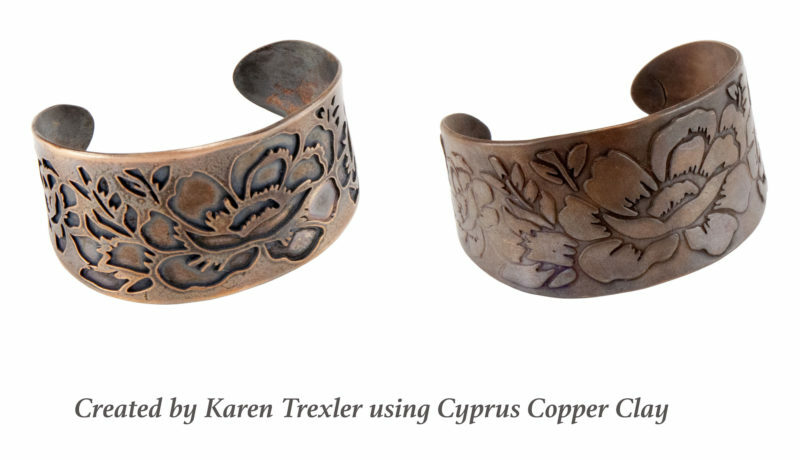 I love jewelry, and I love making jewelry. I also love a good sale. Last weekend I headed to an estate sale. I found a box of stuff, you know, that stuff that is found in old drawers. The short story is, for a few dollars, I found a cardboard box full of junk, with the exception of a couple of things. 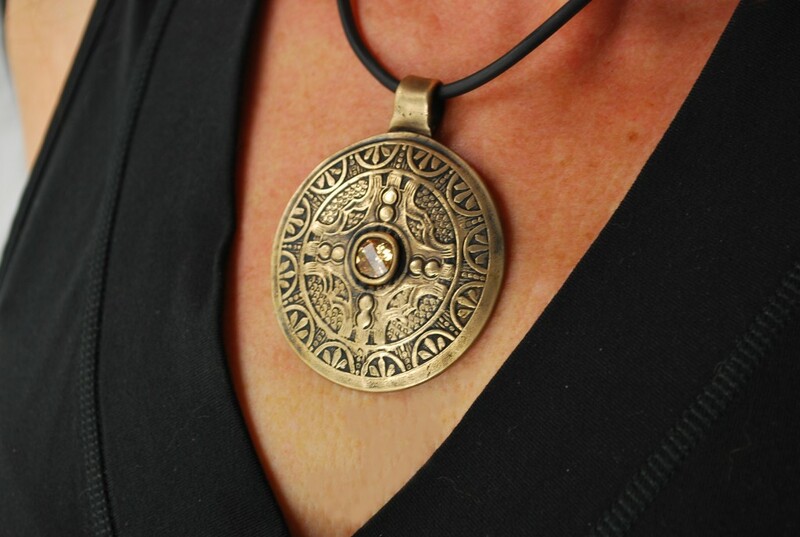 One being this really cool over sized medallion. I couldn’t wait to get back to my studio and make a mold of it. 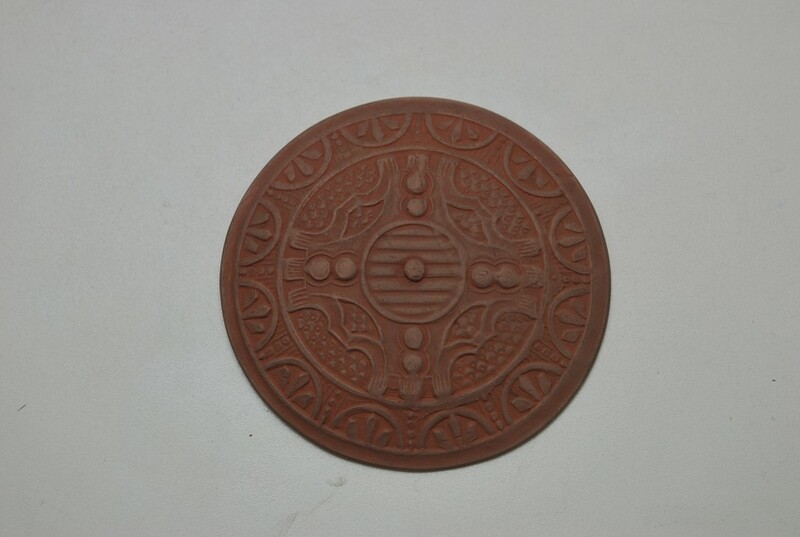 I created a mold using a two part silicone mold material and pushed in my BRONZclay. 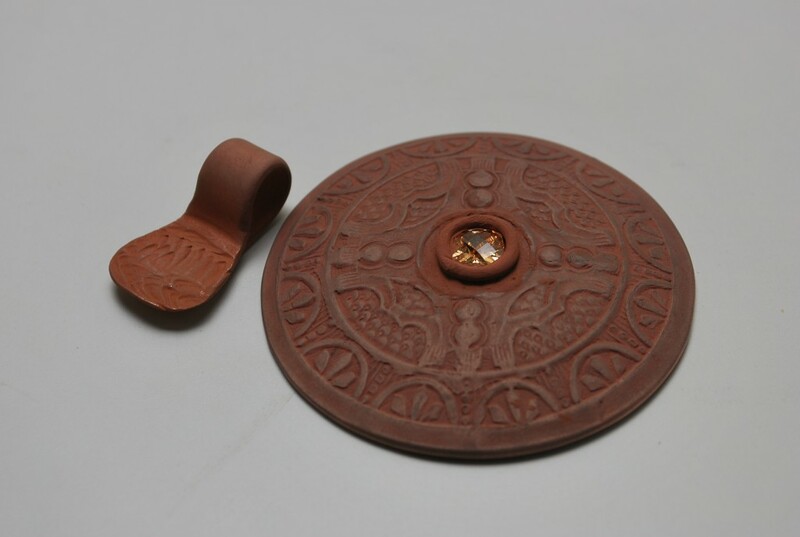 I centered the textured clay over a large copper drying form and used the dehydrator to get it to the greenware state. After 30 minutes I started refining the piece. I quickly cut a hole in the center to allow for the pavillion (the portion of the cz below the girdle) to set in. I made a bezel, making sure I properly captured the girdle (the outer edge of the widest part of the cz, separating the crown from the pavillion) of the cz. CZ nestled into the cut hole. 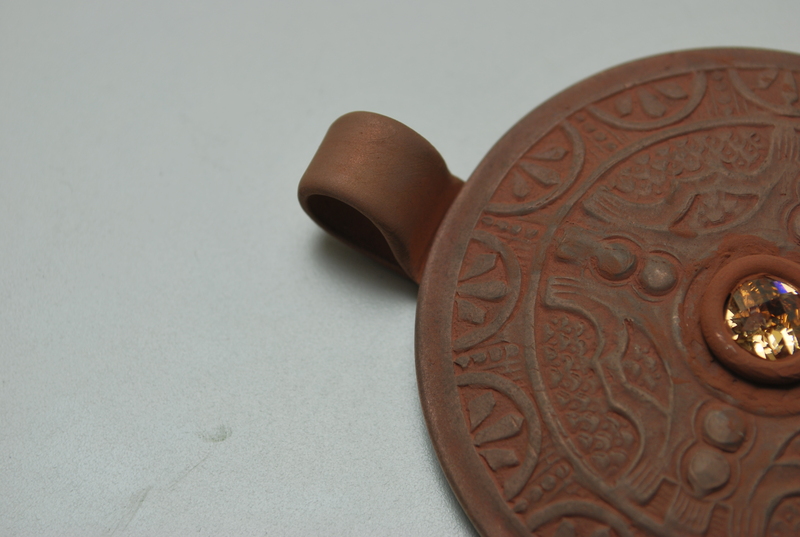 I made a snake with the BRONZclay and pushed it through a syringe to create the bezel. This photo is before sanding. 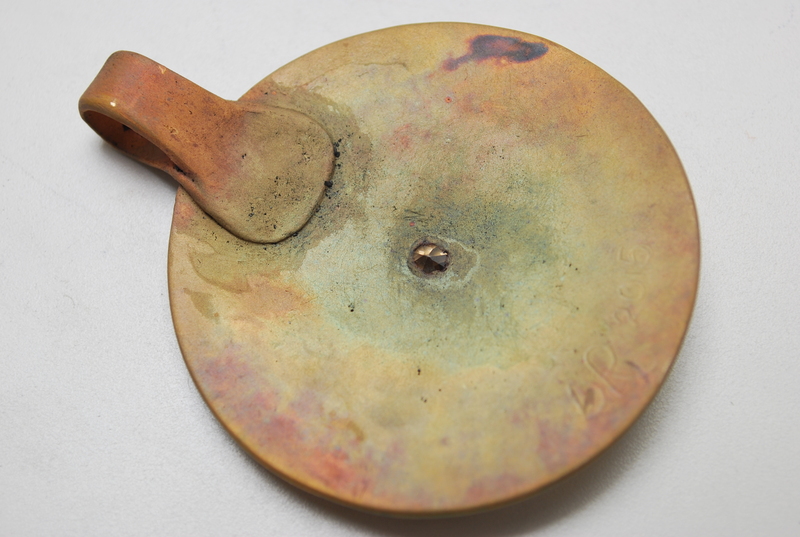 A bail was fashioned from the leftover scrap(s) of clay. Considering the larger size of this piece, the bail was made just a little “beefy”. Because of its extra large size. Bezel refined with bail ready to attach. 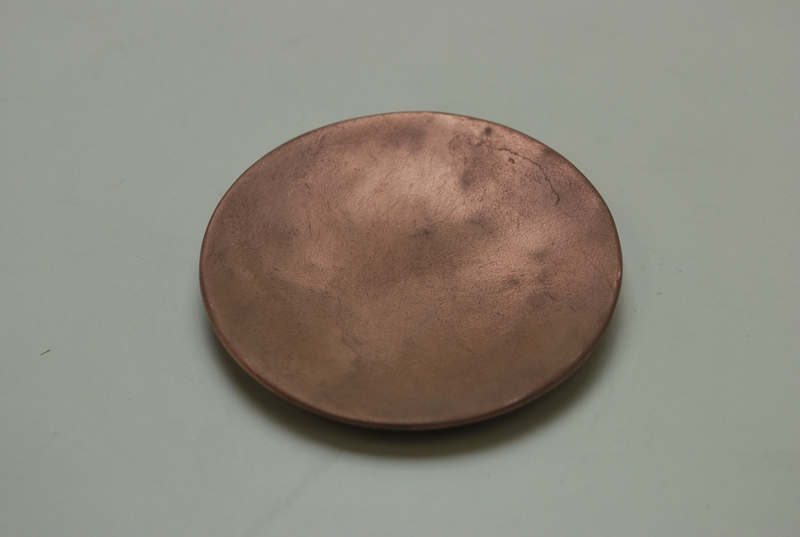 Bail pasted on with bronze slip and dryed. 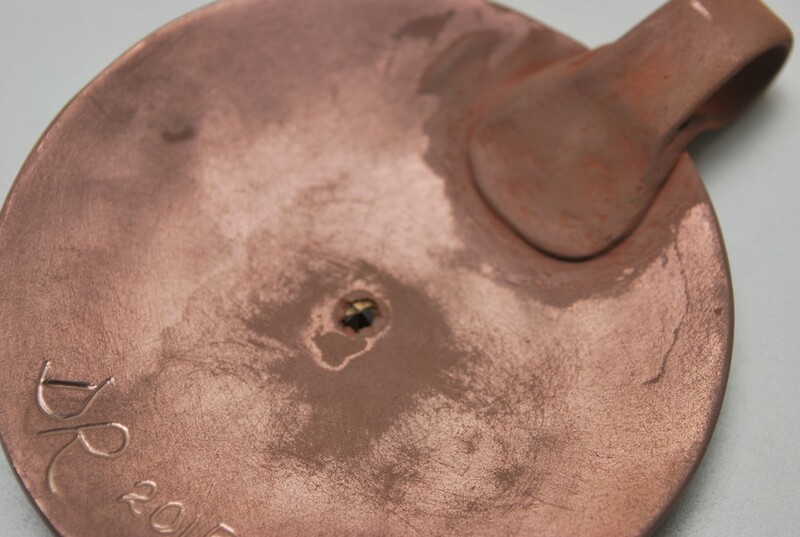 Photo also shows the hole for the CZ. I fired it in coal carbon in the kiln for the long schedule of 500F/hr ramp with a target temperature of 1550F and held it there for a full 2 hours, to ensure a full and complete sintering. 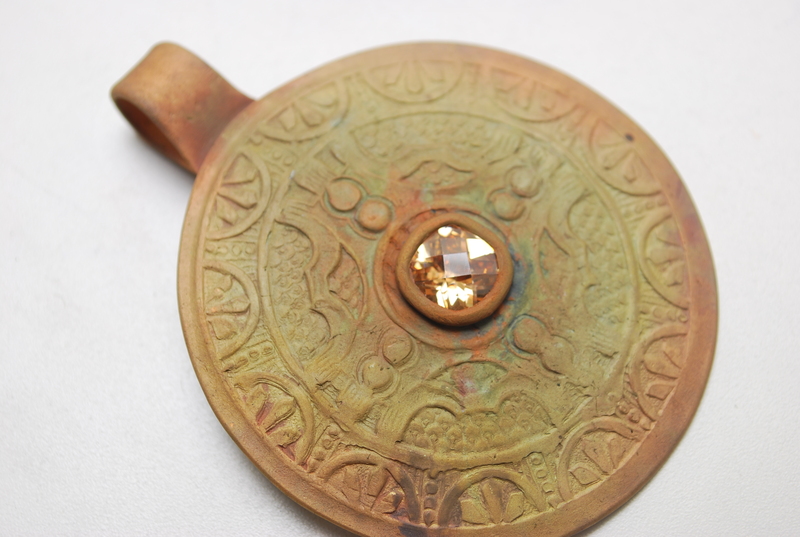 The firing was successful, and after cleaning, I treated it with Patina Gel to give it an antiqued finish. 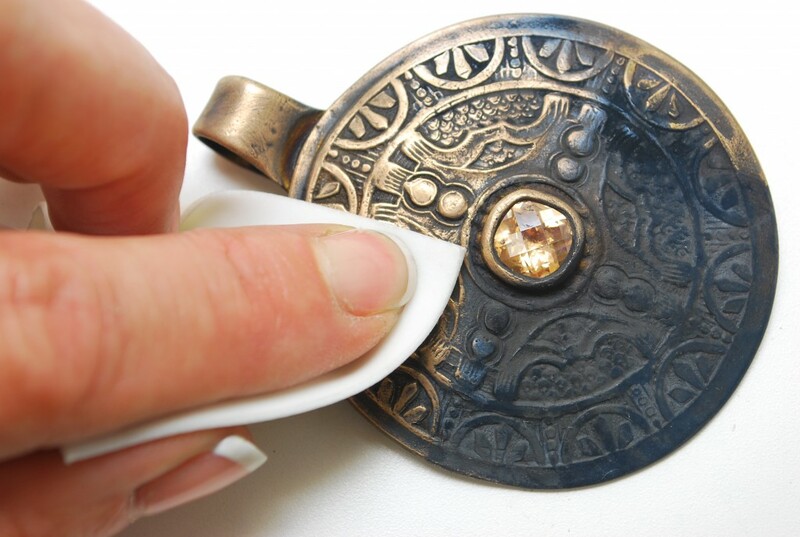 Polishing after a dip in Patina Gel. I really like how it turned out. The bronze is great with this champagne colored cubic zirconia, and overall, I’m happy with the contents of my auction find. 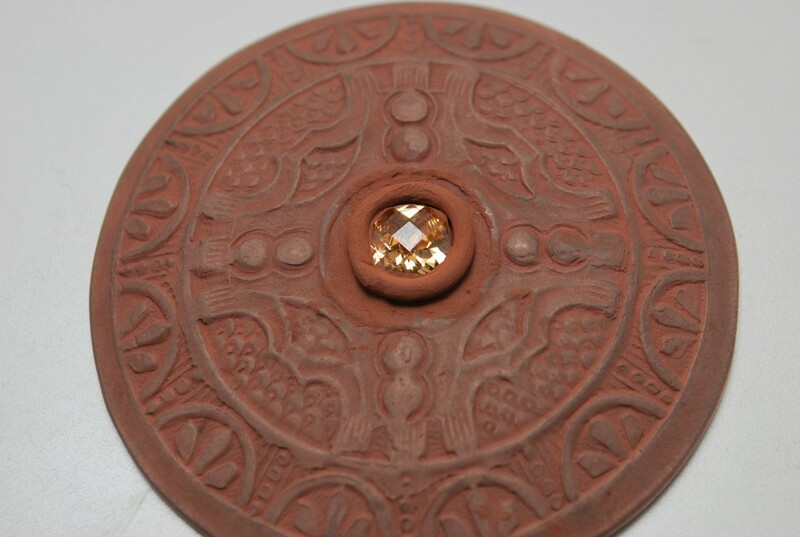 This piece could also be made into a large bracelet cuff, or just use the center to make matching earrings. We have this design available on our website. 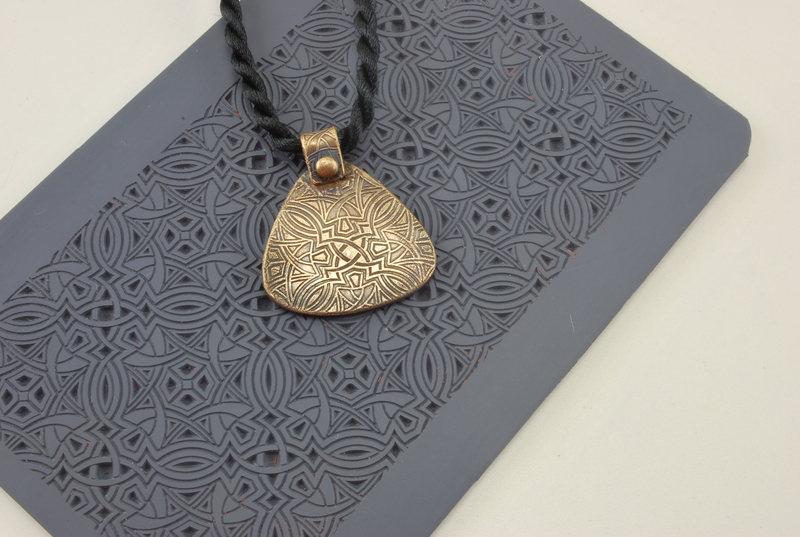 Click here to shop for the Aztec Medallion mold. 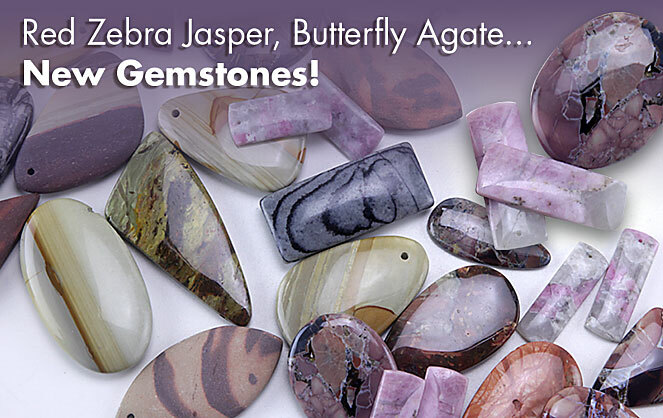 Previous post: New Gemstones – Brecciated, Butterfly Wing, and Mushroom Jasper & Orthoceras Fossils! 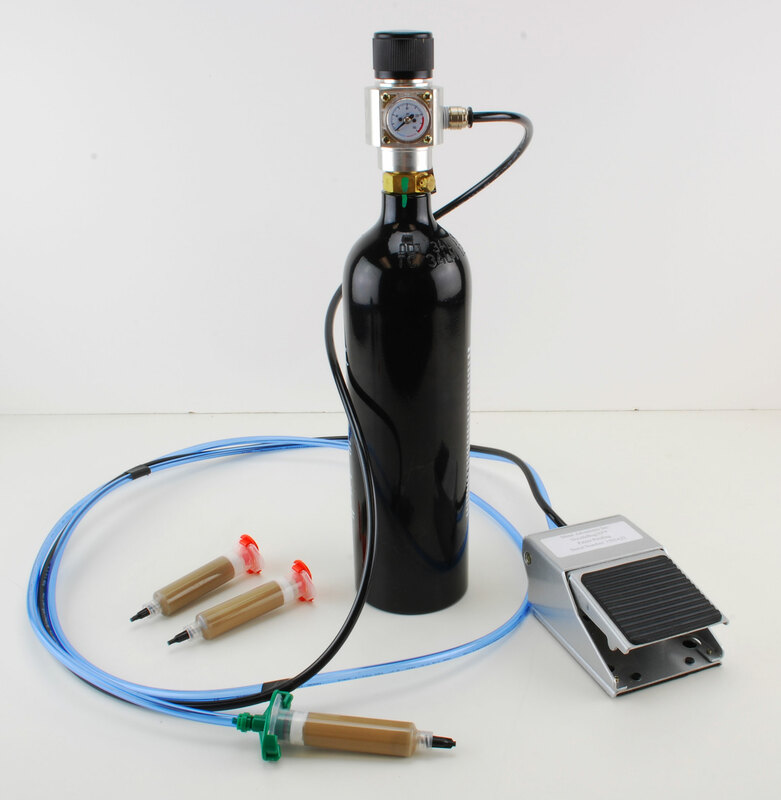 Next post: Support Bill Struve and His New Invention!